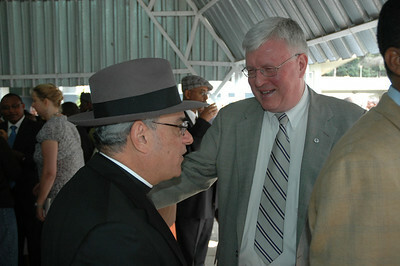 About 1,000 people attended the Jan. 17 EECMY celebration. The Rev. 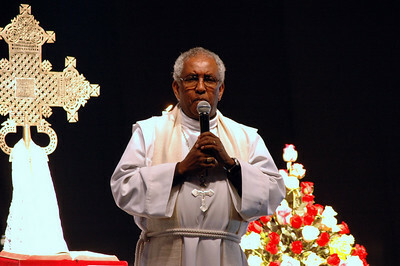 Gemechis Buba, a native of Ethiopia, and currently a staff member of ELCA Evangelical Outreach and Congregational Mission, preached at the EECMY celebration. The Rev. Rafael Malpica Padilla, left, ELCA Global Mission executive director, speaks with the Rev. John Halvorson, an ELCA pastor who recently completed a two-year LWF assignment in Ethiopia. 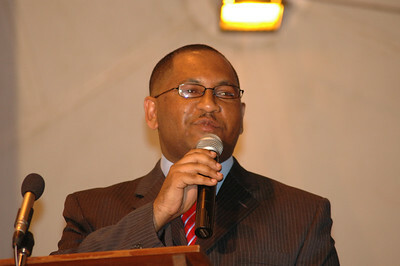 EECMY President, the Rev. 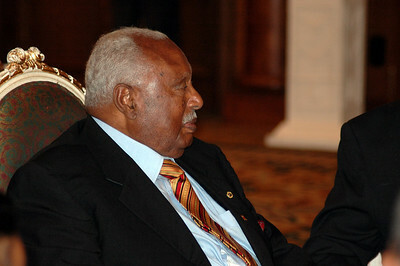 Itafa Gobena, left, speaks with Ato Degefe Bula, speaker, House of Federation, Federal Democratic Republic of Ethiopia, at the Jan. 17 celebration. Bishop James Arends, ELCA La Crosse Area Synod, offered a prayer at the EECMY celebration Jan. 17. 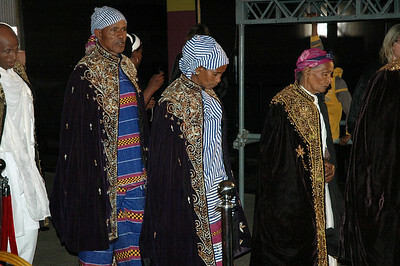 Ethiopian President Girma W. Girogis spoke and presented awards at a banquet Jan. 18 for EECMY's 50th anniversary. The Rev. 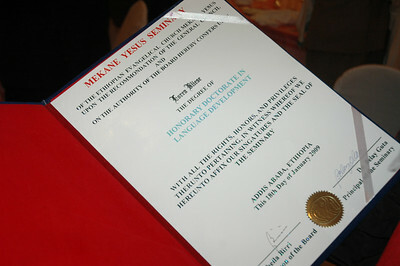 Loren Bliese, ELCA pastor and longtime missionary to Ethiopia, was given an honorary Doctor of Language Development by the Mekane Yesus Seminary of the EECMY, Jan. 18 in Addis Ababa. At left is the Rev. 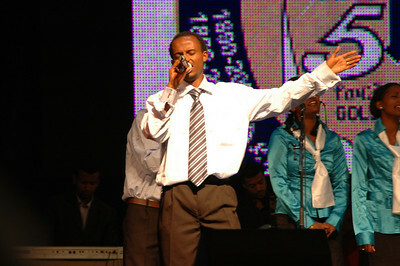 Itafa Gobena, EECMY president. 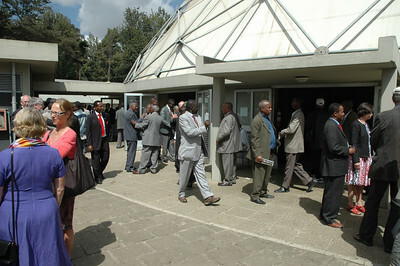 ELCA personnel were present at the Jan. 18 worship service in Addis Ababa, marking the 50th anniversary of the EECMY. They are, from left, Gaylord Thomas, ELCA Global Mission, The Rev. John Halvorson, and the Rev. Loren Bliese, who served as a missionary to Ethiopia 44 years before retiring. Bliese is now a part-time volunteer missionary to Ethiopia. The Rev. 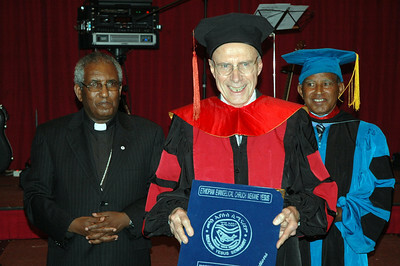 Loren Bliese, ELCA pastor and longtime missionary to the EECMY, was presented this honorary doctorate by the Mekane Yesus Seminary, Jan. 18, in Addis Ababa. 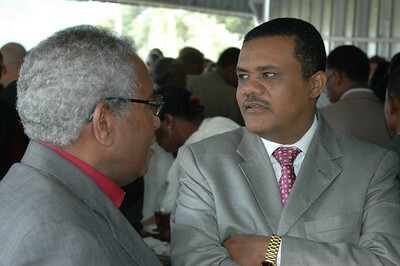 Gaylord Thomas, left, ELCA Global Mission, has worked with the Rev. 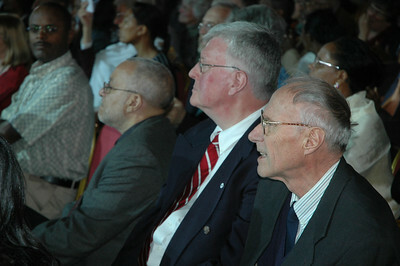 Loren Bliese, right, for many years while Bliese was serving as a missionary in Ethiopia. 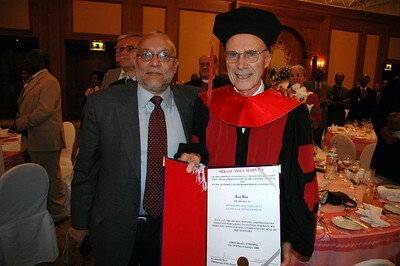 Bliese was honored by the EECMY's Mekane Yesus Seminary with an honoary doctorate Jan. 18 in Addis Ababa. 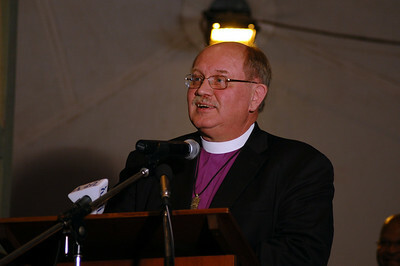 Church of Sweden Archbishop Anders Wejryd, left, was among the church leaders who attended EECMY's 50th anniversary celebration in Addis Ababa. 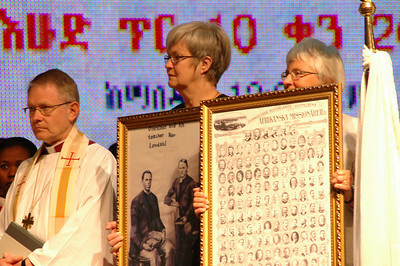 The Swedish church presented historical photographs of early Swedish missionaries to the EECMY Jan. 18. Choirs led singing at the Jan. 18 worship service celebrating EECMY's 50th anniversary. The Rev. Itafa Gobena, EECMY president, welcomed some 2,000 worshippers who attended the Jan. 18 service in Addis Ababa celebrating EECMY's 50th anniversary. 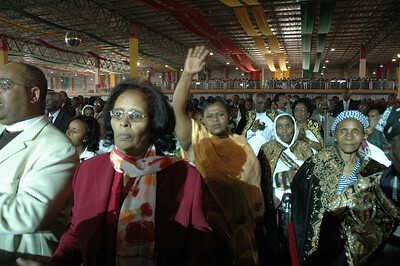 As many as 2,000 people filled Millenium Hall in Addis Ababa Jan. 18 for a celebratory worship service for the EECMY's 50th anniversary. Bishop Zephania Kameeta, represented the Lutheran World Federation at the EECMY's 50th anniverary worship celebration Jan. 18. 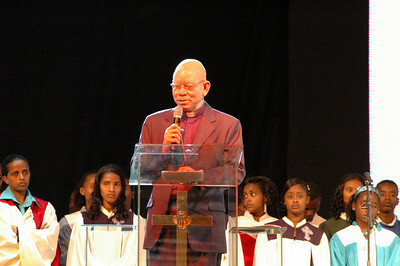 Kameeta is bishop of the Evangelical Lutheran Church in the Republic of Namibia. The EECMY recognized several couples at the church's 50th anniversary worship Jan. 18. They are EECMY members who have been married 50 years.